Deemed ineffective as propaganda and shelved for 50 years by the British government, this wartime short directed by master of suspense Alfred Hitchcock reenacts a true story of the French Resistance against fascist collaboration during World War II in the French colony of Madagascar, Africa. The film's m.o. was not suspense but rather an open-book lesson on the ins-and-outs of collaborationism, nationalism, and underground fighting. The film pays tribute to a hero of the Resistance, records how it was done, and reflects on the reflection. Hitchcock stamps every scene with the contradiction that this is a liberation story among colonizers, either by use of colonial symbols or by inserting the colonized themselves. A baroque array of political machinations, choices and attitudes to freedom are compacted into just 32 minutes of pure composition while delving into themes of perception, morality, and disguise. 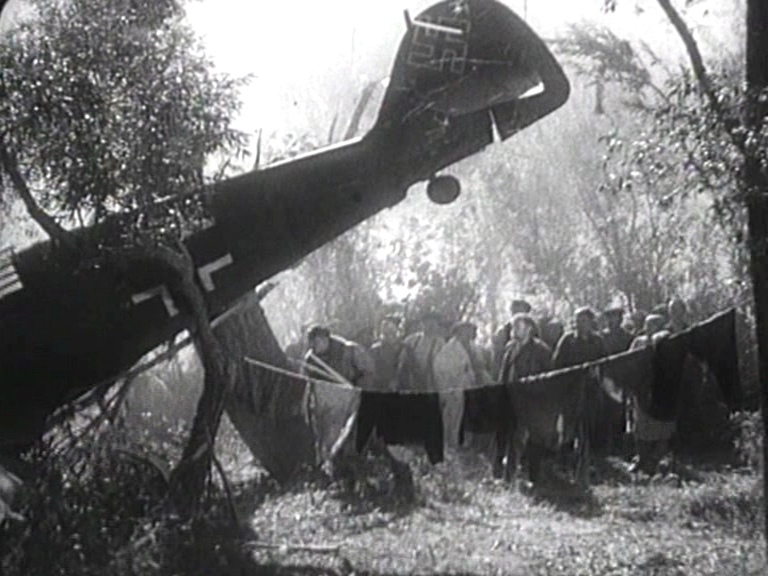 Film historian David Bordwell summarizes: "A French pilot's plane is downed in a (Soviet) forest, where a resistance group is hiding out and forming its own little community. Living under the imminent threat of Nazi discovery doesn't forestall songs, romantic affairs, and mistakes born of the language gap: 'I love you.' 'I don't understand.' 'I don't understand.'" Boris Barnet, one of the greatest of all Soviet filmmakers, was quite popular in Russia yet his films, full of life, are almost totally forgotten today, or remain unknown in the West. Particularly A Good Lad, which was not released at the time of its production during the Second World War, but only later screened in the U.S.S.R. in 1959, then was considered lost again until premiering once more in 1999 at the Moscow Film Museum. "Barnet's A Good Lad is (in one hour!) a musical, a comedy, a love story, and a war movie--and everything is perfectly balanced and free" wrote critic/filmmaker Serge Bozon. Program total running time: 3 hours. There will be no introduction. Special Thanks to Chloe Reyes, Bill Krohn, Pierre Leon, Travis Miles, and Bruno Andrade. "Kino Slang" is a new regular series of cinema screenings,--typically a double-bill and a short on the chosen night--programmed by Andy Rector at the Echo Park Film Center in Los Angeles. This iteration of Kino Slang will continue the cinematographic and historical excavation, proceedings by montage and association, silent alarms and naked dawns of this eleven-year-old blog. Notes on the program and series, documents and translations, ephemera and images related to the films at hand will appear here both before (see below) and after the programs. What we know about Aventure Malgache (1944), the remarkable short Alfred Hitchcock made to show how the flame of the Resistance had burned brightly in the colonies, we owe to Alain Kerzoncuf, who discovered that Jules Francois Clermont, the actor who plays Clarus, the leader of the Resistance in Malgache (Madagascar), had been a lawyer there before the war and had lived the adventure told in the film – as if Pina, the heroine of Roberto Rossellini’s Open City, had been played, not by Anna Magnani, but by a real heroine of the Resistance. By 1944 Clermont had joined the Moliere Players, a troupe of exiled French performers assembled in London, because the Allies could no longer employ him in a staff position during the coming invasion of the continent. Having been on the stage before taking up the law, he now went back to his first profession. After meeting with Hitchcock, who had travelled in steerage to London to contribute to the war effort, Clermont was commissioned to write a script in tangy colloquial French with Hitchcock’s future collaborator Angus MacPhail, whom the director first met at the Claridge Hotel in London during preproduction for this film and another, Bon Voyage, made to be shown in France when the Allies landed. (The opening credits address a specific “vous” that never saw the film: the French people who had been living under Nazi occupation.) The collaboration with the gifted MacPhail lasted until the writer died of alcoholism after outlining the structure of Vertigo (1957) for Hitchcock. * Aventure Malgache, shelved until 1999 at the request of the French, who didn’t care for its portrayal of the political and economic contradictions at the heart of the French Empire during the Occupation (for example, the black-skinned servants whose wordless presence makes its own comment), didn’t fare much better, but both have now gotten their due. Ars longa, vita brevis. The account of Clermont’s war in Aventure Malgache cuts some corners for reasons of budget. He was being shipped to a penal colony when British warships stopped the convoy and freed him, setting him up as Radio Free Madagascar on a ship in the Indian Ocean. 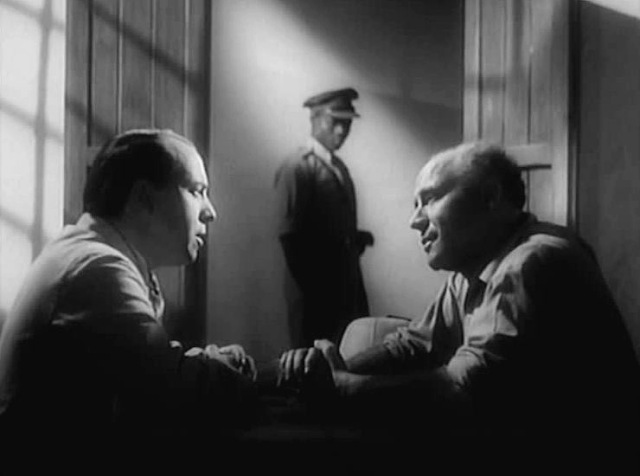 Hitchcock, who didn’t have the money to film a scene at sea, built a dungeon-like set for Clarus’s maritime prison from which he could see the smoke-stacks of British ships coming to save him. (His joyous exclamations are greeted by a fellow prisoner’s muttered “’giveafuck”s, which are left un-translated in the BFI’s subtitles.) The British invasion of Madagascar, which is shown in newsreel footage, then leads to the scene where Clarus has the pleasure of broadcasting back to the man who imprisoned him, the gangster and Vichy turncoat Michel (Paul Bonifas), that the British are coming for him. The film pays tribute to a hero of the Resistance by having him reenact for Hitchcock’s camera the daring subversion that made him famous. Clarus introduces the show with a few words in Malagasy, the language of Madagascar, then does the “knock knock” sound effect that introduced all his broadcasts. Poverty of means spurs a wealth of invention. It’s hard not to read this as a metaphor for Aventure Malgache, a better film than Spellbound (1945), which Hitchcock put on hold when he came to England, despite MacPhail’s contributions to the latter when he followed the director back to California: David O. Selznick spent lavishly on Spellbound, then lopped off MacPhail’s opening sequence, set in a mental asylum, and truncated the dream sequence planned by Hitchcock and another gifted collaborator, Salvador Dali. Selznick’s tinkering paved the way for the psychoanalysis-on-skis sequence that would be Hitchcock’s ludicrous first attempt to portray that impossible-to-portray process until he and screenwriter Jay Presson Allen finally nailed it with the Psychonalysis in the Boudoir sequence that resolves the mystery of the heroine’s frigidity in Marnie (1964). By way of contrast, despite the gripes about too much dialogue from “users” and professional critics alike preserved on iMdb, Aventure Malgache deftly pulls off a psychoanalysis of the Occupation carried out in France’s colonial unconscious, tucked away out of sight in the Indian Ocean, which anticipates the triumphs wrought by “talky” Hitchcockians ranging from Eric Rohmer to the Straubs long after Aventure Malgache had been consigned to the vaults. The situation we see in the dressing-room of the Moliere Players (a troupe created to give French actors in exile a way to participate in the fight while hiding their identities to protect their relatives in France) is one that could really have happened: Clarus advising a colleague on how to play the villain in a play they’re getting made up for by telling him about his personal nemesis in Malgache to enable him to get into the skin of a real-life Nazi. As the two actors in the dressing-room are getting ready to step on the stage, the one who will play the villain of the piece gradually dons the make-up that accompanies his inner transformation as he gets into the character with Clarus’s help. It would have taken a while for French spectators – had they been permitted to see the film -- to realize that he’s the same actor who plays Michel in the flashbacks. Hitchcock has never been subtler, in fact. Clarus recounts, and the film shows, how the Resistance-friendly governor of Madagascar was forced by Michel to put a spy on Clarus’s tail to uncover his Resistance activities. Back in the present of the film’s narration the other actors in the dressing-room joke that Clarus must have been killed and ask how he could get away with anything while being tailed. “Nothing simpler,” says Clarus. Cut to Clarus entering the cellar that is Resistance headquarters to address the troops, arm in arm with his tail. The ceiling of this odd little set is decorated with symbols from the Zodiac: Fate, looming like Wagner’s Valkyries over the Resistance, will have to be overcome by guile. As with the real and reel Michels, the spectator has to use his eyes to understand these gags, and the actor playing the part of the false spy doesn’t make it easy. His dress and demeanor change considerably between the office of the Governor, where we met him, and the cellar, and no dialogue hints that this is the same man come to the aid of spectators who haven’t been paying attention. 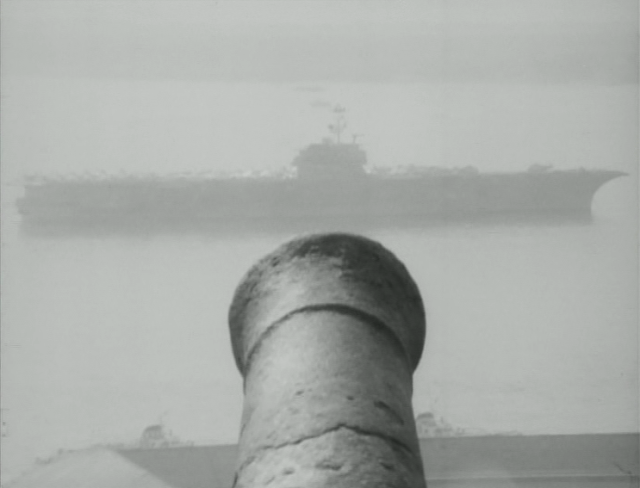 In Bon Voyage, Hitchcock’s other wartime short, the action recounted in flashback happens at night, teaching the spectator a political lesson in how to read images. Aventure Malgache, which happens in bright light (including an uncanny scene of treachery illuminated through a sheet), is a lesson in how to see. 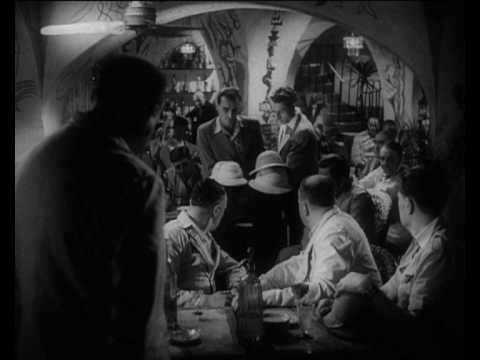 At the end of the film the nameless actor preparing to play a Nazi, who now sports Michel’s moustache, picks a fight with the indignant Clarus, who realizes when the transformation is complete that his colleague has become Michel and they are talking to each other the way they did back in Malgache. They have become the characters they’re playing, like Norman Bates in Psycho, still sixteen years in the future. As they leave the dressing-room to go on stage “Michel” buttons the jacket of his Nazi uniform and Clarus dons the costume of a Resistance fighter. The flashback is over, but the struggle goes on. Does the budget alone account for the bare-bones staging of some scenes, like the one with uncanny illumination where a hysterical woman whose motives are never explained in words picks up the phone to denounce Clarus, where the set is a bed and a gauze curtain with a light behind it? *** Perhaps, but the production seems to have had a dolly, a costly piece of equipment for a no-budget short, which the director uses here to pull back until the phone that seems to be controlling her actions, like the stolen money on Marion Crane’s bed in Psycho, is in the frame. Other scenes where the dolly is being used in offbeat ways include the one with the pooterish Vichy General, during which the camera moves closer to the characters, almost imperceptibly, until Michel is center frame, then pans right each time the general paces nearer to the camera. There is also a rather modern quick dolly-in on Michel during the trial. For viewers who aren’t hypnotized by the dialogue they hate (cf. those iMdb comments), there’s quite a lot being done with the camera in this little film. If Lifeboat is a film influenced by Brechtian stagecraft, Aventure Malgache is a Freudian miniature, with Michel occupying the place of Willie (Walter Slezak), the German submarine captain. “I see the type you mean,” says Boniface, playing the nameless actor who is having Michel explained to him in preparation for his own performance as a Nazi he considers underwritten and opaque. “A rat like Laval” [a Vichy official executed after the war]. “No,” says Clarus, “he was a roly-poly man…” Surfaces are deceptive when the Unconscious is calling the shots. Aventure Malgache also reproduces the mythical structure of Lifeboat by equating the rise to power of Michel, a gangster, with a period of misrule: a dark carnival that can only end in when the Lord of Misrule who presides over it is killed. Although we don’t see Michel go before a firing squad, we’re assured that the British weren’t fooled by him when they arrived in Malgache. He sticks his framed picture of Petain (shown in the first insert used in this little film) under the fridge, prudently stashes his bottle of Vichy Water -- this is the second insert -- inside the fridge, an expensive but invaluable item in the tropics in 1944, and puts up a picture of Queen Victoria where Petain had been. 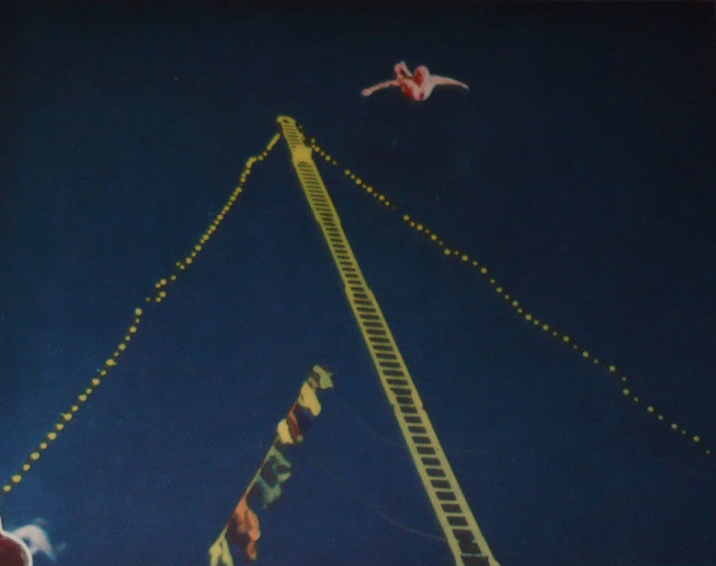 The last dolly (a cut, actually: Hitchcock’s own pricey equipment had its limitations) isolates the motto at the top of the painting: Honi Soit qui Mal y Pense, Latin for “Shame on anyone who sees evil in it” — an ironic motto that French spectators in 1944, who spoke a language descended from Latin, would have had no trouble parsing: Michel, who embodies Collaboration, would be quickly spotted and put to death by the Free French accompanying the British invaders, the way the enraged lifeboat passengers execute Willie when they realize he’s steering them to a concentration camp. 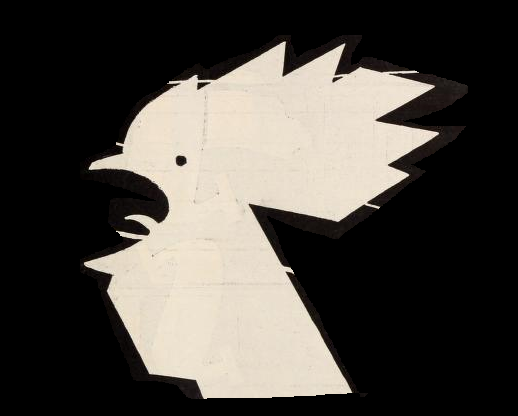 “Hitchcock’s Aventure Malgache (or the True Story of DZ 91),” Alain Kerzoncuf, Senses of Cinema, Issue 41, November 2014. Hitchcock by Francois Truffaut and Helen Scott, Simon & Schuster 1967. Hitchcock at Work by Bill Krohn, Cahiers-Phaidon 2000. *MacPhail had been driven to drink by dialogue writer John Michael Hayes, who should have shared screen credit for the script of The Man Who Knew Too Much (1956) with him but didn’t because the ambitious Hayes was American and a dues-paying member of the WGA, founded in 1954 to look after the rights of American screenwriters, but not of English writers working on American films – a situation that the Guild had not yet figured out, although Hitchcock imposed his own solution: he never worked with Hayes again. When Aventure Malgache was finally released in 1999, MacPhail was properly credited as the co-author of the screenplay with Clermont. He was subsequently the credited screenwriter on such classics as Dead of Night, Whiskey Galore and, for Hitchcock, The Wrong Man. He is cited in books on the Master as the man who invented the concept of the MacGuffin. ***The eerie illumination in the scene where Clarus is denounced to the Gestapo recalls the scene with Judith Anderson and Joan Fontaine in dead Rebecca’s dressing room (Rebecca, 1940). Hitchcock disliked Rebecca because he didn’t have complete control when he made it (cf. the ham-fisted scenes with George Sanders), but for that very reason it seems to have haunted him, as we can see in this little scene in Aventure Malagache where the Unconscious is in the driver’s seat.